By laser diffraction analysis it is possible to measure particles sizes between 0.02 and 2000 µm. The sample is dispersed in either air or a suitable liquid media. The laser passes through the dispersion media and is diffracted by the particles. The diffraction light pattern (He-Ne laser) is dependent on the particle size . The laser diffraction pattern is measured and correlated to the particle size distribution based on Fraunhofer or Mie theory. The use of Mie theory presupposes knowledge of the light refractive index of the particles and the dispersion media and the imaginary part of the refractive index of the particles. Particle Analytical can determine these refractive index parameters. 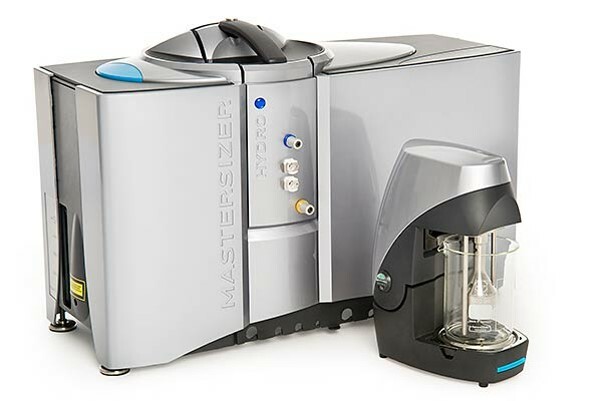 The laser diffraction instrument applied by Particle Analytical (Malvern Mastersizer 2000 and 3000) has a flow-through cell for dispersion of particles in liquid media or a dry dispenser for dispersion of particles in air. Wet dispersion presupposes that the particles are insoluble in the liquid. Therefore method development is required. We typically offer either a simple non-GMP suitability screening or a full length GMP method development. A typical result from a laser diffraction measurement.